Logic Branching in Google Forms – Get the info you really want in the most efficient way! 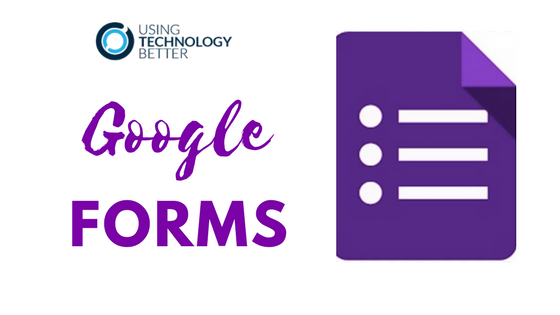 Google Forms are an exceptional tool for collecting information and having it automatically organised and stored in a Google Sheet. Many people I work with are unaware that they can use ‘Logic Branching’ to direct responders depending on how they answer a question. Logic Branching allows you, as the creator of the Form, to choose different pathways for your responders depending on their answer. This is a great tool for collecting information from parents, scaffolding student learning, providing student agency and creating digital outcomes like Pick-a-Path or Choose your own Adventure type stories. Check out this video to see how you can use ‘Logic Branching’ in Google Forms. Look out for my next blog which will show you how to use the ‘Feedback’ feature in Forms to scaffold and support learning for your students. Google Forms gives you the option to randomise questions and answers. This is very useful if you are concerned that the order in which questions or answers are presented in might skew the results or create bias. It’s also useful in classroom situations if you have students who may take a peek at other students’ screens and choose the same answer! In this post, we’ll show you how to use these features and share a couple of tips. If you enable this setting, the questions in your form will be presented in a random order. Before you go ahead and turn it on, there are a couple of things you need to be aware of. First, if your form begins with questions like ‘Name’ or ‘Class’, these could end up being moved to anywhere in the form! Second, if you’ve ordered questions by theme or topic, this too will be disrupted. However, before you get discouraged, there is an easy solution to both of these issues, which is to use sections in your form. If you arrange your form in sections, questions are only randomised within the same section. So, you could have one section that only contains ‘Name’ and ‘Class’, and then other sections for each topic or theme. 2. Click the Add section button to add all the required sections to the form. 3. Add your questions to the relevant sections in the form. 4. Click the Settings (cog) button at the top of the form. 5. Click the Presentation tab, then tick Shuffle question order. The random answer option works with multiple choice, checkbox, multiple-choice grid and tick box grid style questions. It is a per-question setting, so you need to enable it for each question you want to randomise. 1. Create your form and add your questions. 2. Click the three dots in the bottom right corner of the question you want to randomise answers for. 3. Tick Shuffle option order. Want to use these options with a self-grading quiz? 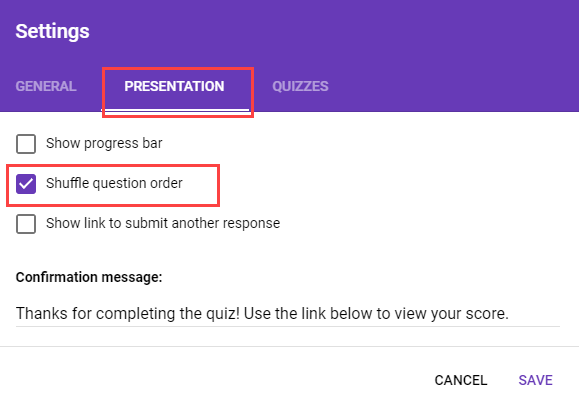 Check out the video below to learn how to create quizzes in Google Forms. 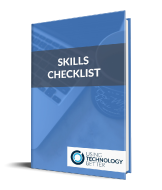 We’ve also got heaps more tips and support on our professional learning community. 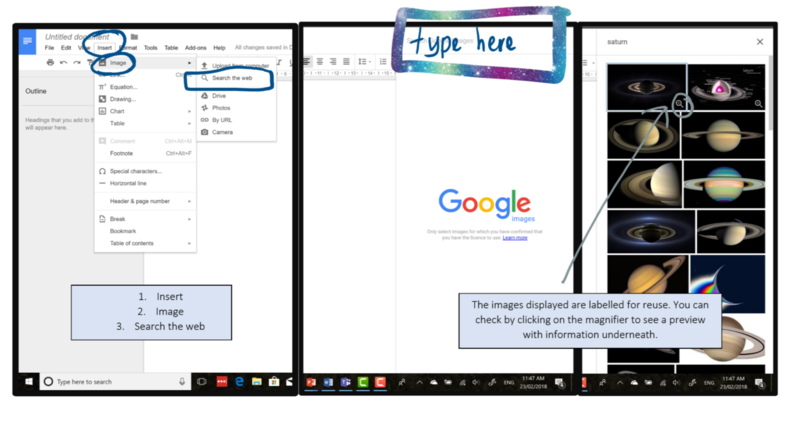 There are numerous ways to work with images in Google Forms. 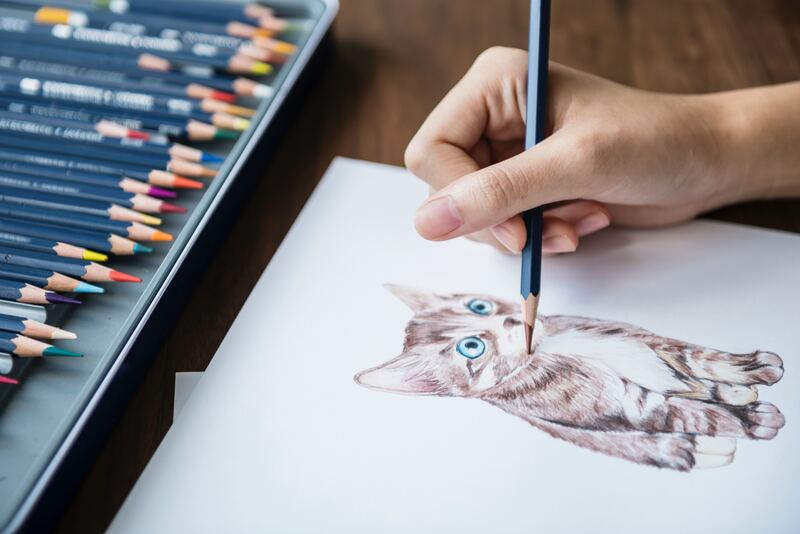 In this blog post, we’ll explore the four different ways you can use images in your form, so you can choose the best one for your situation. The first place you can insert an image is into the header of the form. This is the very top section that is purple by default. The best type of image to insert in the form header is a logo or promotional image related to your school or organisation. Google Forms will then use this image to customise the colour scheme of your form. It’s a great way to make your form look professional and on-brand. 1. 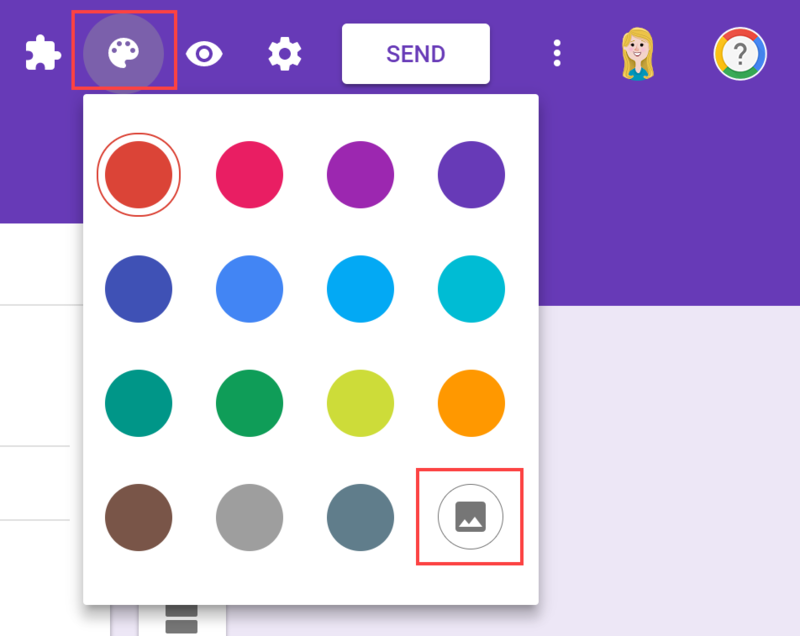 Click the colour palette button at the top of the form, then choose the image button. 2. Choose the Upload photos option. 3. Browse for the image you want to use and click Select. Crop the image if required. Note: The image must be at least 800 pixels wide and 200 pixels tall. If you want to use a smaller image (e.g. your company logo) you could create an image of this size in Google Drawings, copy in your logo to one section and then export the image it as a PNG or JPG file. If your form includes a question that is about an image, you can insert that image as part of the question. 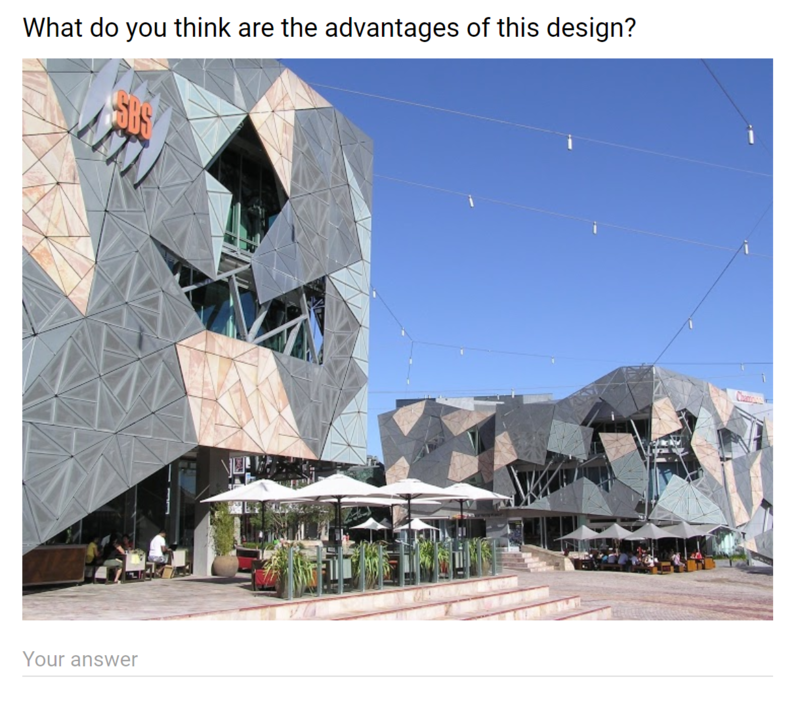 For example, you may want people to provide feedback on a proposed design. To insert an image into a question. 2. Hover over the question text until you see the image button appear. Click the button. 3. Browse for the image you want to insert. 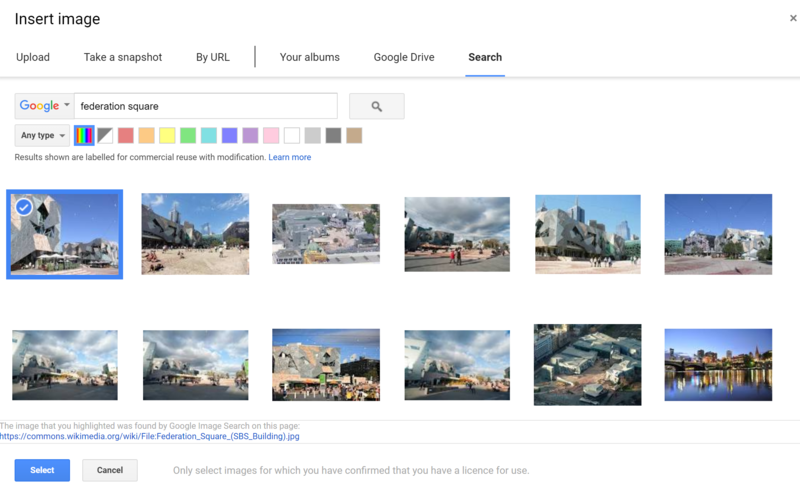 You can upload one from your computer, select it from Google Drive or search for it online. When you find your image, click it and then click Select. 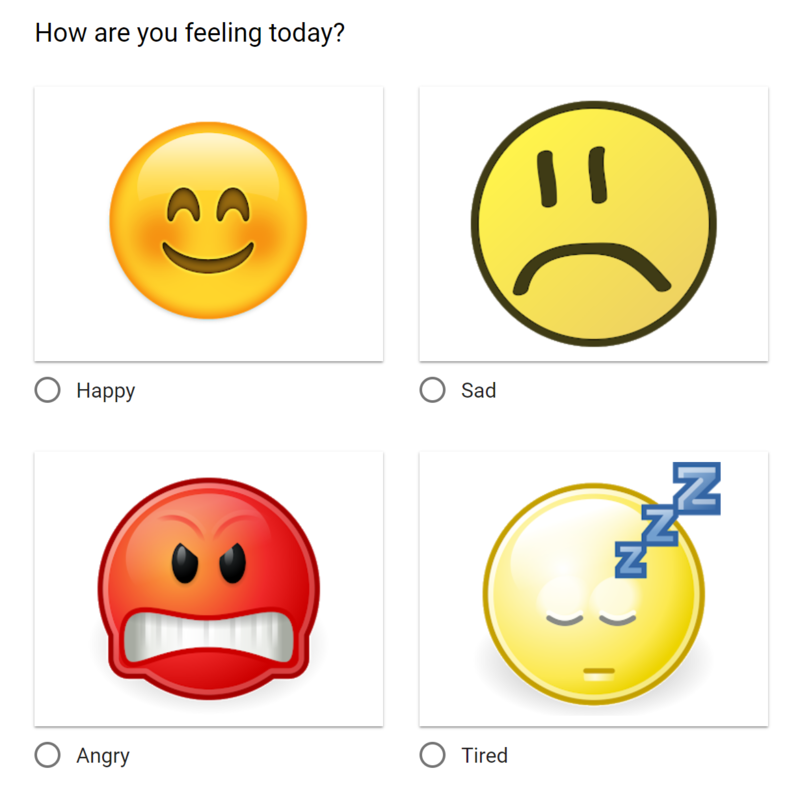 Images can also be inserted as answer options for multiple choice or checkbox style questions. This is useful if you want respondents to choose the design they like best, or when using forms with children (e.g. ffor a self-grading quiz)) or people with low literacy. 1. Add a multiple choice or checkbox style question. 2. Hover over the answer option until you see the image button appear. Click the button. 4. Repeat steps 2 and 3 for each of the answer options. You can also add images to other places in your form, such as the top or bottom of different sections, or in between questions. To do this, click the Image button on the floating insert menu. 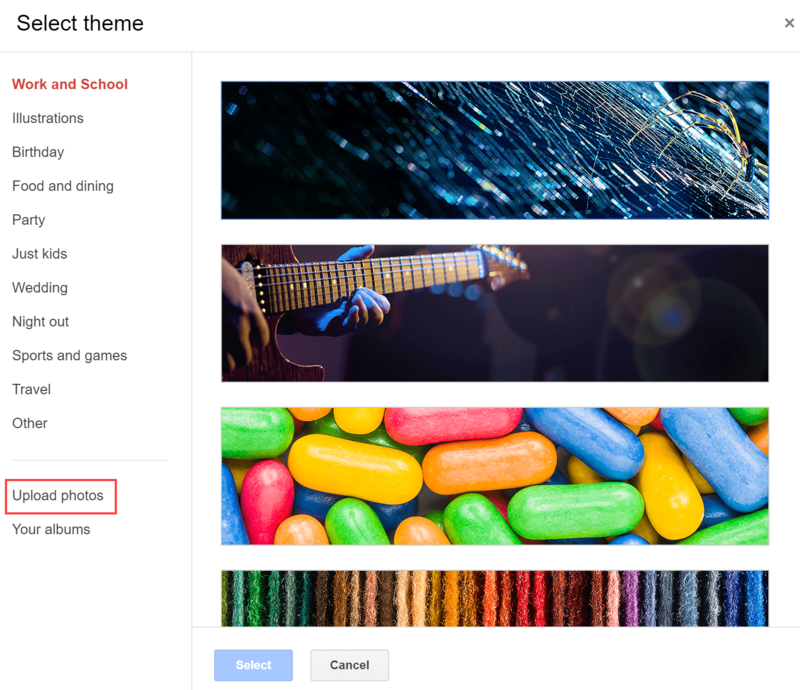 With these four methods, you can use images for a variety of purposes in your Google Forms. Want to learn even more G Suite tips and tricks? Join our online professional learning community. Visually impressive, multimedia assignments and projects are a part of everyday school life for us as teachers and our students. There are endless resources available for finding images that support and enhance the lessons we plan,as well as the learning our students share. Part of the teacher’s role is to ensure that students have an understanding of how to source and use images legally, just as we teach them how to reference and quote other people’s words with citations and bibliographies. This blog post offers five ways to help make sure that your students, (and yourself) are doing just this. Docs, Slides, Forms and Sites all automatically restrict image searches to those images that are labelled for reuse with modification. Students do not even need to leave the comfort and safety of these apps and face the rabbit hole that is Google Image Search to find what they need. Fast, simple and legal! Not only can you filter your image search results by size, colour, type and time, but you can also filter it by the license that it has. To do this just type your keyword into the search bar, select ‘Images’, then ‘Tools’, ‘Usage rights’ then the type of reuse you need it for. Not filtered by license – will show you all images related to your search criteria. Labeled for reuse with modification – anyone can use and modify this image. Labeled for reuse – anyone can use this image, but can’t modify it. Labeled for noncommercial reuse with modification – In very basic terms, this means that you can only use and modify the image if it’s NOT related to business or making profit. Labeled for noncommercial reuse – As above, but can’t be modified. If you’re not sure – get in touch with the rights holder for clarification. Not only is this great for finding images that can be used legally but also for other types of media including music, clipart and video. You can search through all with your keywords or select which places to search. 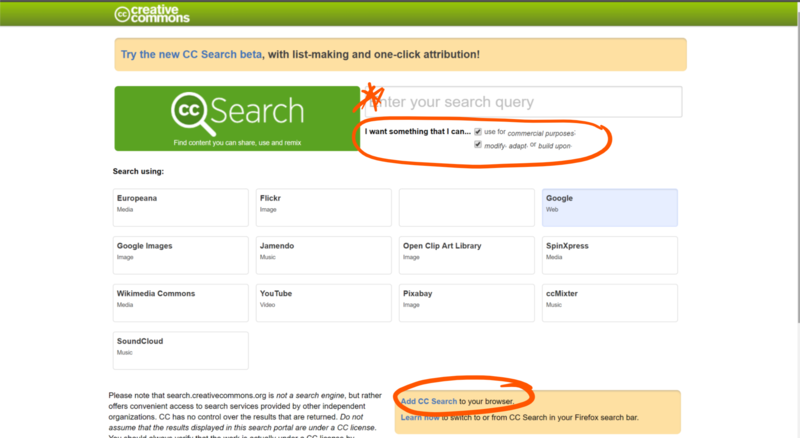 CC Search can be added to your browser to make it even easier. Check out this blog post ‘Five sites to find free high quality images’, by Samantha Vardanega here. With cameras on nearly all devices these days, encourage your students to get out and make their own images. They can then use apps like Snapseed to enhance and tune up their images. Why not draw the image? Or connect with other students who have skills in this area and get them help you out. Use great tools like Microsoft’s ‘Office Lens’ app to turn drawings into quality digital images. Use tools like Canva to create beautiful graphics. It even has built in tutorials that will teach you and your students basic colour and design theory. It’s always really important to pay tribute to the artists whose work you have valued enough to use. Some images may be licensed for you to use WITH ATTRIBUTION. This means you need to acknowledge the rights holder of the image. You can find out more information about that and deeper explanations of different types of licenses on the Creative Commons site. 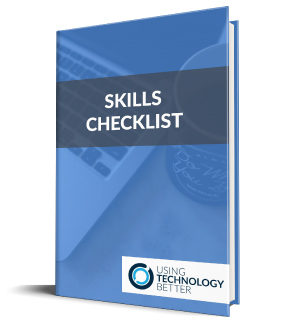 Want more awesome tips and tricks for all things digital? Download the UTB app (iOS or Android) so you are kept up to date with blog posts and events near you. When we asked the teachers we work with what their biggest challenge was in implementing technologies into their classrooms, the overwhelming response was lack of time. This led us to develop the Get efficient with G Suite for Education 30 day challenge to help them learn how to save time with the tools they already have. In this blog post, we bring you five of the efficiency tips that feature in the challenge. Email management is a major source of inefficiency and frustration for many. The auto-advance lab in Gmail helps you process the emails in your inbox quicker and with less decision making. After you delete, archive or file an email, the auto-advance lab automatically takes you straight to the next email in your inbox – rather than back to the inbox itself. This is more efficient because you are not wasting time going back and forth between the inbox and emails. Further, you are not spending time deciding which email you should read and process next. Because of this, we find people are more likely to delete, archive, file or action emails they typically avoid! 1. Select the Settings cog > Settings > Labs. 2. Find and enable Auto-advance, then click Save changes. 1. Select the Settings cog > Settings. 2. Scroll down until you find the Auto-advance section. 3. Choose if you want to automatically go to the new newest or oldest conversation and then click Save changes. A word of warning, this feature does take a short time to get used to! I encourage you to stick with it for a few days while you adapt and then you’ll notice the time-saving benefits. Another source of inefficiency in the school day is interruptions from students or colleagues who need your help. This usually occurs just as you’ve gotten into a rhythm on a task! Google Calendar’s appointment slots can help you manage these interruptions by giving your students and colleagues a way to pre-book time with you. You can specify the times they can choose from, ensuring that it ends up convenient all round. Learn more about this feature and how to set it up in our blog post on scheduling time with your students using Google Calendar appointment slots. 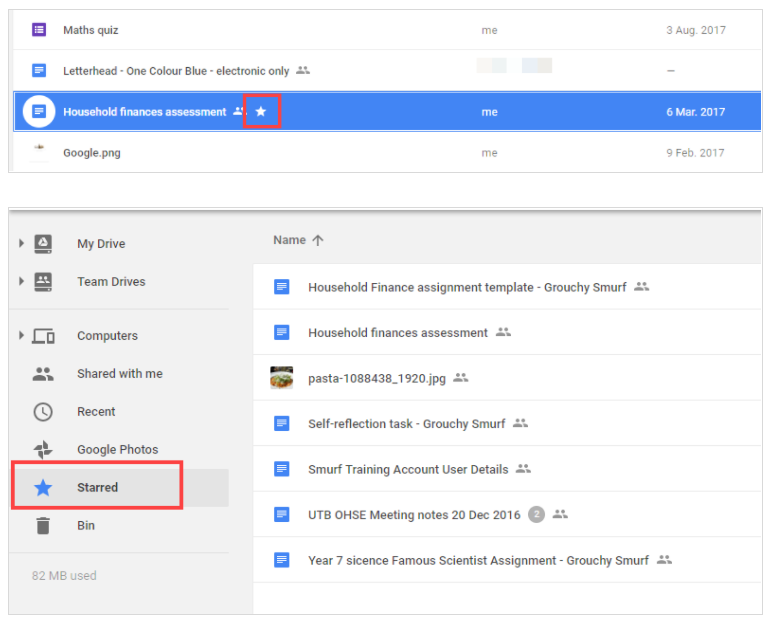 If you are struggling to organise or find files in Google Drive, you’re not alone! This is a time-waster we hear about very often. One technique that helps combat this is using stars to ‘bookmark’ files and folders you use regularly. When you add a star to a file or folder, it is displayed in the ‘Starred’ view (see the screenshot below). By accessing this view you can quickly find the file or folder you need. This is a great time saver for accessing files or folders that are buried deep in a folder structure. Instead of spending time clicking through several layers of folders, all you need is one click into the Starred view. 1. Click the file once to select it. 2. Press the ‘s’ key on your keyboard. Note: There are other ways to add a star, but this is the quickest! Google Forms are great time savers in their own right. But there is one feature that can help combine multiple forms into one. This means your data is all in the same place, making it easier to manage and compare. For example, imagine you are collecting sport team preferences for three year levels. Instead of distributing and managing three separate forms, you can use one form that differentiates the options based on what year level the student is in. The feature that does this is the ‘Go to section based on answer’ option that you can enable for any multiple choice question in a Google Form. You simply put each set of differentiated questions in a separate section, then tell the form to move to that section if a student selects the answer that corresponds with it. 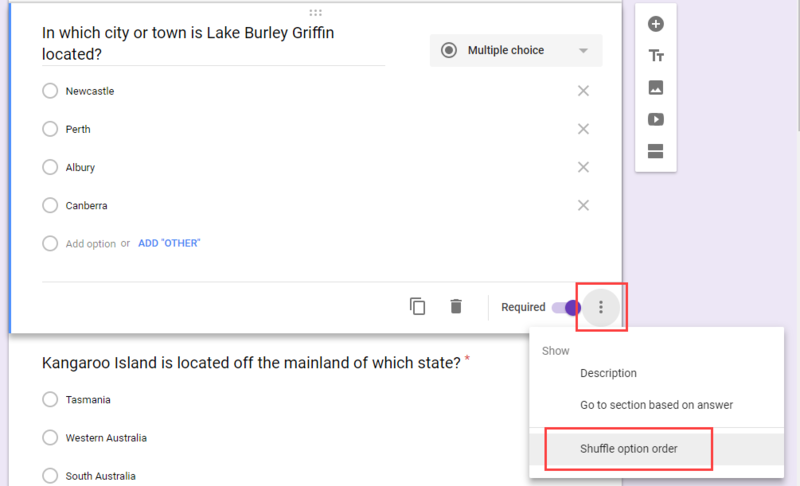 Learn more about this feature and how to set it up in our blog post on tips for advanced Google Forms users. If you’re a G Suite user, the chances are that every time you open Google Chrome you end up navigating to Gmail, Google Drive and maybe Google Calendar. Wouldn’t it be quicker if these and other sites you use every day just opened up automatically for you? 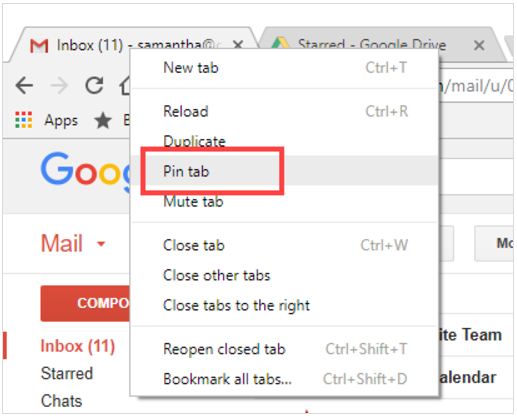 You can achieve this using the ‘pin tab’ feature in Chrome. 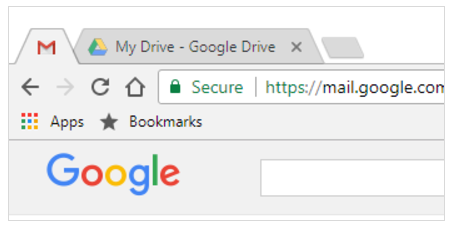 Tabs that you ‘pin’ load automatically when Chrome is opened. The other benefit is that they are displayed as ‘mini’ tabs without close buttons, meaning you cannot accidentally close them. 1. Open the website you want to pin. 2. Right-click the tab and choose Pin tab. Google Forms make data collection quick and easy. If you want to do even more with your forms, the growing range of add-ons are a great way to add extra features and functionality. In this post I’ll share the five add-ons I always tell our education and business clients about. This add-on allows you to automatically email Google Form responses to specific people (including the submitter). You can create a custom email message that includes key information from the form response in the subject and the body. This is great for automating administrative processes, confirming bookings and notifying people of form submissions. Learn more here. If you’ve ever wanted to automatically close off a Google Form, this add-on is for you! It lets you set criteria for when the form should be closed, including a date/time or number of responses. This is very useful for ensuring deadlines are met or booking limits are not exceeded. Learn more here or check out our blog post on automatically closing a Google Form at a specific date and time. This add-on automatically removes question options when the designated number of people have selected them. It is perfect for allocating people into teams or time slots, as it prevents over-subscriptions and double bookings. Learn more here. docAppender appends Google Forms responses to the end of selected Google Docs. The destination Google Doc is selected as part of the Google Form submission. For example, the respondent could choose the name of a person or department to have the submission added to their document. This add-on is great for logging and tracking information. Learn more here. There are quite a few add-ons that can automatically turn Google Form submissions into Google Docs and PDFs. 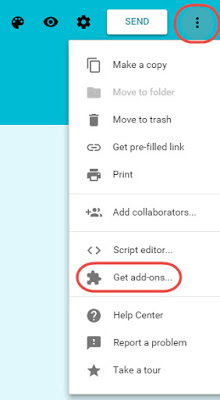 This add-on does that too, but can also turn submissions into Google Slides. This is very useful for creating certificates or any other highly-visual materials that are better done in Slides than Docs. Learn more here. 3pm Friday!) and then forgotten to close it at the deadline? Worse, have you had students or colleagues submit after the deadline and then had to have an awkward conversation (Sorry, my mistake!) or accept their late responses? 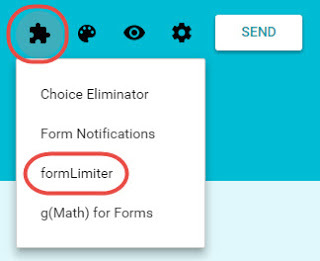 If so, you’ll love the formLimiter add-on for Google Forms! The formLimiter add-on automatically closes Google Form submissions at a date and time you specify. It can also close the form after a certain number of responses have been reached. Note: These instructions are for the new Google Forms. If you’re using the old interface, just look for the Add-ons menu to complete steps 2-5. 1. Open or create the Google Form you want to automatically close. 2. Click the three dots menu botton (top right) and then Get add-ons. 3. Locate formLimiter in the add-ons library. Hover over it and click the +Free button to install. 4. Grant permissions to the add-on when prompted. 5. Click the Add-ons (puzzle piece) icon > formLimiter, and then choose Set limit. 6. Click the Limit drop-down box and select date and time. 7. 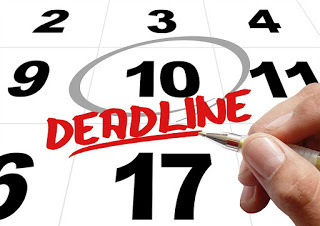 Enter the date and time to close submissions in the appropriate fields. Note: This will be in the same timezone as your Google account. 8. Customise the submissions closed message if required. For example, you may ask students respondents to get in touch with you directly if they need an extension to the submission date. 9. 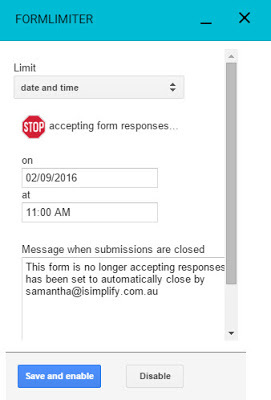 Tick Email form owner when submissions are closed if you want to be notified when the form closes (scroll down to find this option). I find this a useful reminder! 10. Click Save and enable. That’s it! Your form will now automatically close – one less thing to try and remember! This short video demonstrates how to use Google Forms, Google Docs, Google Sheets and the autoCrat add-on to make managing the peer feedback process quick and easy. Hello, Samantha here from Using Technology Better. Welcome to this video on using Google Forms, Sheets and Docs for peer feedback. Peer feedback is a great classroom strategy for encouraging student involvement in, and responsibility for, learning. It can also help students deepen their understanding of the subject matter and it’s a good way for them to practice giving constructive feedback to others, which is, of course, a key collaboration skill. Using a peer feedback process also means that each student gets an audience for their work that actually goes beyond the teacher. Managing their peer feedback process can be a little bit difficult, particularly with a large number of students. However, if you use Google Forms to collect the feedback, you can then use Google Sheets and the autoCrat add on to automate the distribution of the feedback to each student. This is an easy way to speed up the process and it ensures each student gets their feedback in a clear and well structured format. So let’s take a look at how to set it up. So the first thing is that you need to have a Google Form. So here’s one I’ve set up. There’s no right and wrong way to do this. This is just one way I’ve done it and you possibly already have your own preferred peer feedback questions. In this case, there are a couple of things you want to make sure that you’ve got in there. The first thing is the name of the student giving the feedback. So we’ll call this the reviewer and I’ve got that in the ‘What is your name?’ question. Then I need to select who they’re actually giving feedback on. So you may have this as a free text field if you’ve got a lot of students. I only had a small amount so I actually did it as a drop down box style question just so I could make sure that they selected correctly. Particularly, if you’ve got younger students this might be a good strategy as well. The next important one is the email address of the student that the work was from, so the student that’s being reviewed. Now, again, if you’ve got young students who don’t have emails then that’s a little bit difficult and you can leave this bit out and the teacher can then provide the document to the student themselves. In this case we’re going to imagine that they do have email addresses and the students are able to pop that in and the feedback’s going to be emailed to them automatically. So what I have done here is just made a note to the person filling in the form to copy and paste an email address from a list. For instance, I would pop in here a URL to a shared Google Doc or Sheet and the student could just find the person that they’re reviewing and copy and paste the email address and that just avoids having any problems with mistakes and stuff. The other thing I do is in here I set this to short answer and I come down to the little three dot button in the bottom right corner and pop on data evaluation. That then lets me select my type of validation. Select text and you can then select email address. This at least makes sure that a valid email address is entered into this question. And then the last three ones, I’ve just gone with the best things, a couple of suggestions, and any corrections. So you could pop whatever questions you want in there. So once the form is set up, we then need to have a template for where we want this feedback to go into and this is in the form of a Google Doc and this is what the student will see at the end. So the student that’s being reviewed will get this. So at the top here I have a Google Doc and you can see here I’ve set it up, very simple, heading and the three questions. Now you’re probably wondering what these odd looking words with the little symbols are here. So these are what we call merged tags and they’re represented with a double ended arrow. So this is how autoCrat knows where to put information in this template. So what it’s basically going to do is take the responses to this form, insert them in this template, and create that template for every single student. So you will see here names and that would be the name of the student that’s being reviewed. That would correspond to this question here ‘Whose work are you giving feedback on?’. Now in this particular template you actually don’t have to match the merged fields here to the questions in here. You just have to make them similar enough so you can identify and match later on, but I usually keep them short and sharp just so that it’s easy and you can see that I’ve got name, reviewer, best improvements, corrections, so that will then add the right question from the Google Form into each section of my document. So once we’ve got that template and we’ve got the form the next step is to open up the spread sheet that’s attached to the form and run auto correct. So we jump onto the responses tab and then we click on the little spreadsheet icon on the right here. It’s going to prompt us to create a new spreadsheet and we’ll click create. So now that the spreadsheet’s open, you’ll see that it’s got no data in it at the moment. So we’re going to set it up so that autoCrat runs whenever a form is submitted. So that will mean that as soon as a student gives peer feedback on another student, the student being reviewed will get that email straight away with their feedback. So no delays, there’s no need for you to go and have to manually do something, so that’s probably a really quick and easy way to do it. So now we need to install the autoCrat add on. So we’ll come up to add-ons. Now I’ve got it installed already but if you don’t you can come down to get add-ons and you can search for the one called autoCrat and you can see what that looks like here. So if you haven’t installed it, it will prompt you just to allow it to run and stuff like that. So follow the prompts, accept everything, and when it’s ready and it’s installed you can come back to this menu. So we’ll select autoCrat and we’ll click launch. So it does often take just a moment to load so just be patient there and it will load on up. Okay, so you can see there I’ve got no jobs set up. They call it a merge job because basically it’s merging data from the Google Form with the information in the Google Doc template to produce something. Now it wants you to give it a name, so I’m going to call mine ‘Peer feedback merge’, you can call it whatever you like just make sure it’s something that you can remember for later on if you’ve got to identify it. It’s easily identified. So we’ll click next. The next thing is it wants us to choose the template. So you can see here I’ve recently used some other templates that are not the ones that I want to use so we’ll actually come in and say, ‘Choose a template from Drive’ and this template is the one we created earlier, which is sitting at the top, which is where we want our questions to go. So you can see here ‘Peer feedback template’, so I’m going to click that and click select. Okay, so here again we’ll just take a moment to load and it will op on in. There you go, ‘Peer feedback template’. So click next. Now at this point you need to map the data to the template. So you need to map these column headings to these merge fields that we put in the template and you can see here sometimes it takes a bit of a guess if they’re really similar. Now mine are quite different, so first of all ‘name’. So that is the name of the student that is actually being reviewed. So that’s whose work you are giving feedback on. Okay, ‘reviewer’, that was the column that says, ‘What is your name?’. So you just got to go through and match these up and you can see here, ‘What are the best things about their work?’, ‘Improvements’, ‘Suggestions for improvements’, and ‘Corrections’ with the spelling and grammar errors. So that’s fine there all mapped up so we just click next. At this point you want to actually pop in what you want each of the documents it produces to be called. So, for instance, we’ve currently got the document called ‘Peer feedback template’. We obviously want that for the students, so we might just call it something like, ‘Peer feedback’ and we actually can use those little merge tags in here as well. So I could put ‘peer feedback’ dash (-) and then I can copy and paste, ‘Whose work are you giving feedback on?’, which will be the name of the student that the feedback is for. Now this is really important. These ones here have to exactly match these ones in the spreadsheet. So even down to the question mark and stuff like that, and you do need those little double ended arrows on either side. Okay, so just to make sure, you might want to copy and paste them. So what I did earlier is I copied and pasted them into a Google Doc so then I could just quickly copy and paste them over and know that I had no errors. You can set it as a Google Doc if you want to with the output or you can select it as a PDF. So whatever is most appropriate for your situation you can pick. Now you also can create multiple documents. So this is one document and that’s what we’re going to do in this situation because we want each student only to get their own document. For instance, if you were doing this just for the purpose of you and you perhaps didn’t want to distribute it to the students you could pop them in a single document and then you would just have them all in the one place. So whatever works for your situation you can choose from here. So clicking next again, we have to choose a folder where all of these documents are going to be stored once they’re created. So the choose folder button, I prepared one earlier, is going to be a folder in Google Drive. So I created one called ‘Peer feedback merged docs’ and click select. So just make sure you’ve created a document, a folder, before you actually go through this process. So next again, dynamic folder reference, this allows you if you want to, to actually store each document in a different folder based on the criteria. Okay so maybe a different folder for each student or something like that. In this case I’m not going to do that so I’m going to skip it. Now a merged condition. Again, this lets you do a specific action based on a condition. So it might be that you only want to create the documents or merge the fields for forms that were submitted after a certain date or if a particular student or a particular class, so you can do that if you want to. Again, I don’t need to do it here so I’m going to click, next. Okay, so then we get to what do we want to do with these documents once they’ve been created? So we want to share, yes. And we can choose because we’ve chosen a Google Doc, we can choose to share it as an editable doc, view only, comment, etc. and we can even change it to PDF again here. So I’m just going to go to a view only doc. Now allow collaborators to reshare. So this is if you were sharing as an editable doc this would be relevant because if someone has edit access to a Google Doc they are allowed to reshare it. In this case it’s actually not relevant so I can put it on but I’m going to leave it as yes because it’s not relevant. So the next option is sending from a generic no reply address. So if for some reason you don’t want to have your email address as the sender on the emails you can do this. So perhaps if you were using a personal email account because you didn’t have a school-based account that would be okay. In this case I don’t need to, so I’m going to leave it as no and it’s just going to come from my email address. So then we come down to what we actually want to pop in the email that’s going to be sent to the student that’s being reviewed. So first of all we need to pop in their email address. So obviously the email address is going to be different for each student, but that’s why we asked the email address in the form. So I am going to pop in the merge field that had the email address, which was, ‘What is your email address?’ So, again, if has to exactly match the column heading up here. So if I wanted to I could CC to someone or something like that. You don’t need to CC it to yourself because it will appear in your sent mail and I’ll show you that shortly. So then we pop in the subject, so we might just say, ‘Your peer feedback’ and what we can even do here is say, from, and then we could pop the name of the student that did the review. So, again, we can pop it in that merge field here and then we can type in the message. So I prepared one earlier, which I’m just going to paste in for you. So you’ll see here, it’s ‘hi’ and the name of the person that was getting the feedback. Here is your peer feedback from whomever the person is that did the review, review it, etc. and then that document will be attached at the bottom. So now that we’ve set that up we can click next. Now this is the one I really want to show you. So job triggers, okay so what we could do, if we wanted to, we could just get all the feedback and then we could look through, check this and then we could run the merge manually and it would produce all the documents and send the emails at the same time. Or, as I mentioned earlier, we can do it so that when the reviewer submits the form it creates the document automatically and emails the student straightaway. So you’ll obviously know what situation is better for yourself. If you want to do it manually you would leave this as no. I’m going to show you how to run on the form trigger so we can just see how that works but then also I’ll just point out where you would run it manually if you want to. So I’m going to say yes to run on form trigger. It prompts you to enable it. We can just click yes. Okay, so once that’s processed now we are done and we can click, save. So once it’s saved we’ll get another screen that’s going to pop up. So you can see here it’s listed as an existing job and there’s the name of it. If I hover over it, okay a couple of things, I can delete it, I can come here and preview what it’s going to look like, I can edit it if I want to make changes, and I can run it. Now in this case because I’ve set it up to run when the form is submitted I don’t have to run it. It will run automatically. As I said before, if you want to let everyone submit the feedback and then run it manually that’s when you would wait until you’ve got all the responses, come in here and click the run button or like the play button and it would run the process. Okay so we’re done here. I’m going to close it and I’m now going to just leave this as it is, jump back to my form, pop it into preview mode and I’m going to fill it out. So what is your name? So I’ll write Sam and I’m going to give feedback on Brainy Smurf and I’ve got their email address here and I’ve also pre-prepared some responses to the question. So once they’re in we’ll submit the form and then we’ll see what happens. Okay, so that’s done, click, submit, see there, thanks for giving feedback. So if I jump back to the spreadsheet you’ll see the response is in there. Now in just a very short period of time we’re going to notice at the end here that it’s going to pop up some extra columns, which is going to be autoCrat running the merge and telling us that it’s done. So you can see straightaway here the extra column headings are half popped up and it’s now running in the background because we had it to run automatically. So first of all you’ll see here, document successfully merged, email sent to that address. If I actually want to I can click this link and it will take me straight to the document that was created, but seeing as I put it in a folder I’m going to show you where it is. So if I go now to the ‘Peer feedback demonstration’ folder and I’ve got my peer feedback merged docs and you’ll see ‘Peer feedback -Brainy Smurf. So if I open that up we’ll see now ‘Brainy Smurf, here’s your feedback from Sam’ and all the information that I wrote in that form. Now I always like to do a test of this just to check the spacing and such and straightaway I’ve gone right. I’ve got too much spacing between these questions so I could go back and fix that on my template and once I’ve made a change on my template any future merges will use the new template. So the last thing jus to show you before we wrap up is back in Gmail. In my sent mail I wanted to show you how that looks and you can see there, if I refresh, we’ve got ‘Brainy your peer feedback from Sam’. So this is sent to the student, you can see up there sent to the address that I popped in, and there is the email that they will see with the attached document, so nice and easy. So I hope you find that useful. Thanks so much for watching and hopefully you can use autoCrat, Google Docs, Google Forms and go ahead and implement some peer feedback in your classroom. So thanks again for watching, bye.